Download this bank reconciliation template and incorporate it into your month-end close process. A bank reconciliation is a check between your records (or your company’s) and the banks records. It is a necessary control for every cash account. Going through the bank reconciliation process can identify errors and unrecorded transactions. Want an example of a reconciliation and related entries? 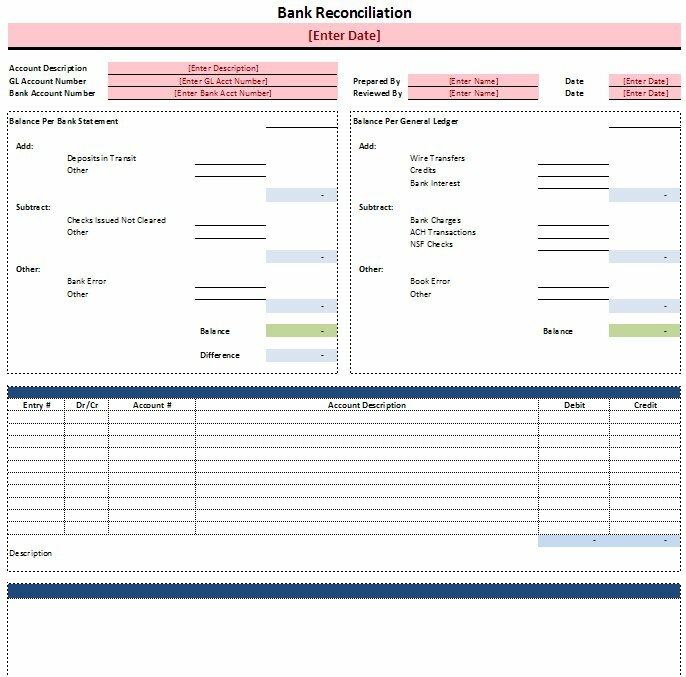 This bank reconciliation template comes complete with example data. Timely Reconciliations – In order for a bank reconciliation to be most effective, it should be done shortly after month-end (yes, one every month). There are several factors that will dictate the definition of timely; however, a good rule of thumb is mid-month. One to two full months after the fact is simply not acceptable, having such a loose control is significantly increasing your cash balance to error and fraud. Segregation of Duties – When it comes to bank reconciliations, it really doesn’t matter how big or small your accounting department is – there should be some level of duty segregation. At the minimum, if you have one accountant, the owner should be reviewing the reconciliation every month; yes, they are that important. Two Column Approach – Because there are so few items that can impact the bank balance (deposits in transit, checks that have been issued but have not cleared, and bank errors), we like the idea of coming to an adjusted bank balance first. Once you have the adjusted bank balance, the general ledger can be reconciled (i.e., adjusted) to that same balance. Document – Memory can and will fail, therefore, notes should be taken that will help solidify that paper trail and significantly reduce research time when questions arise at a later date. 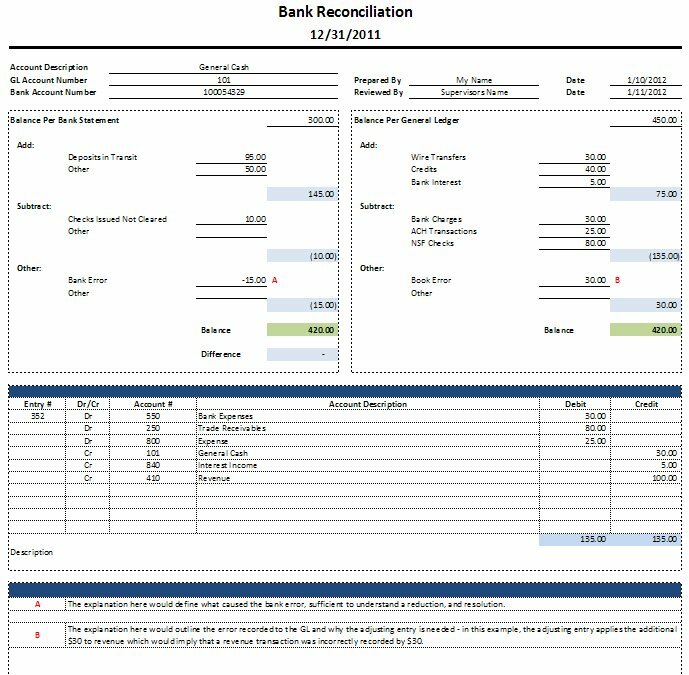 This bank reconciliation template has a section for a unique note for each reconciliation item. Additionally, there is a location for the entry to be documented along with the reconciliation, which should help with the review process. Accountability – The Prepared By and Reviewed By lines should have a manual signature, same with the dates. Other than entering the information specific to your account, there isn’t anything special to using this template. For those of you not familiar with groupings, look at the picture to the left. You’ll notice at the bottom of the template, there are little plus symbols. These can be expanded by left clicking them. Under each grouping we’ve put a red uppercase letter. A red uppercase letter corresponding to each note should be placed next to the reconciling item in the main section of the template. For those not used, just close the grouping. Download a Proof of Cash Template here. Conditional formatting for data entry – notice at the top of the picture above, the pink highlights, this is data that needs to be completed. Also, if the reconciliation doesn’t balance, it will turn red and show you the difference. Set up to print on a single page; print settings may need to be adjusted if data is added. Want more information on bank reconciliations? A bank reconciliation as explained by the AccountingCoach.com along with a detailed example. Walk through the bank reconciliation from start to finish. Try this template out. Note, remember the data included in this bank reconciliation template is example data only. There could be items included that are not relevant to your situation, or items missing that will be necessary for your reconciliation. Additionally, assumptions have been made surrounding the nature of the reconciling items, changes in these assumptions could impact how the entry is recorded.